NFPA's Hands-On Classroom Training is an in-person learning experience that delivers both theory and “learning by doing”. Hands-On training provides first-hand experience in a real-life, controlled environment. Classes are offered throughout the year, you choose the locations and courses that work for you. This 3-day course (NFPA 25 – Inspection Testing and Maintenance of Water Based Fire Protection Systems) will combine hands-on training in a lab setting with classroom learning hosted by NFPA’s Matt Klaus or other NFPA-approved instructors. 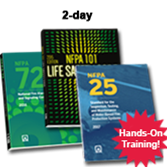 Students will be able to review the 2017 Edition of NFPA 25, chapter-by- chapter with an expert NFPA instructor then apply what they’ve learned on actual equipment. Return to your job with knowledge and experience you can apply immediately. With a better understanding of NFPA 25 along with the hands-on experience you should save time and money on planning, installations, reviews, maintenance, training and more. All attendees will have the opportunity to learn how to help keep buildings, assets and people better protected. Specifically, building owners and property managers will gain a better understanding of what they need to maintain their fire protection systems by properly managing their vendors. Installers, contractors, engineers and inspectors will see fire protection equipment in proper working order---giving them an inside view of why NFPA 25 is so important and the value of their part of the process. Matt Klaus, NFPA’s Technical Lead for Fire Protection, talks about the 3-day NFPA 25 course that will combine classroom learning with hands-on training and demonstrations in a lab setting. Students will be able to review NFPA 25, chapter-by-chapter with Matt then apply what they’ve learned on equipment in a state-of-the-art lab. 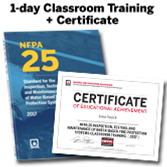 New for the 2017 edition of NFPA 25 -- get the fundamentals of water-based system inspection, testing, and maintenance in just one day! 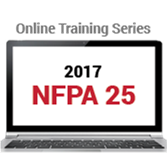 Go online to get a solid introduction to sprinkler ITM based on the 2017 edition of NFPA 25! You're invited to attend the NFPA 13 hands-on training. Facility Managers require in-depth knowledge about the potentially life-saving systems that protect building occupants and now you can see those systems in action. This 2-day course was developed expressly for anyone serving in the role of Facility Manager, with special hands-on training and demonstrations of the critical fire protection and life safety systems in your facility -- as well as how requirements in NFPA 101®, The Life Safety Code, NFPA 72®, National Fire Alarm and Signaling Code and NFPA 25, Inspection Testing and Maintenance of Water Based Fire Protection Systems, are applied in practice. After expert-led classroom instruction and demonstrations in a state-of the-art laboratory, you’ll walk away with the insights and know-how needed to help manage vendors, provide answers to AHJs, and ultimately, keep occupants safe. Learn about the life-saving systems that protect your building’s occupants, and see those systems in action. Hands-on Training features classroom instruction led by experts from NFPA plus special hands-on training and demonstrations of the critical fire protection and life safety equipment in a state-of-the-art lab. Hands-on training in a lab setting for facilities managers includes demos of NFPA 101®, NFPA 72®, and NFPA 25 compliance. 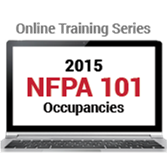 Learn how the 2015 NFPA 101® helps ensure fire and life safety in different occupancies. The Life Safety Code® Occupancies Online Training Series provides training tailored to type of building. Instructors who are NFPA employees are compensated for their time by salaried compensation and non-employee instructors are compensated at the successful completion of the course in accordance with the annual instructor agreement signed by the instructor. Prior to each training, non-employee instructors shall make it known to learners any proprietary interest in a product or service discussed. The instructor shall not promote products or services during any NFPA training activity.